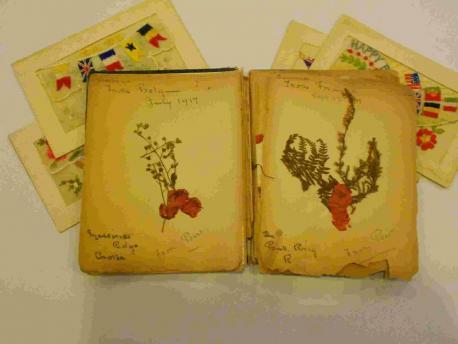 A soldier’s album, filled with pressed flowers collected by during his time at the Front during the First World War, is to be auctioned in Dorchester, Dorset. The unique record was almost lost forever when it was thrown into a skip during a house clearance. Thankfully it was retrieved before it could come to any harm. Amy Brenan, of Duke’s Auctioneers in Dorchester, said: ‘The album is a marvellous record of one soldier’s travels in Europe during the First World War. ‘What is particularly nice is that the album of pressed plants and flowers was clearly put together as a gift. ‘Most of the pages are labelled as “From Bert” so perhaps he was compiling the album for his sweetheart back home. ‘Despite the distance, he was clearly relying on thoughts of his loved ones to keep him going. In 2013, Duke’s Auctioneers sold the Roughton Poppy, the world’s oldest poppy, picked in a frontline trench in Arras, northern France in 1916 by Private Cecil Roughton. The auction will be held at Duke’s Grove Auctions on Tuesday, 11 March at 10.30am. For more details call the saleroom on 01305 257 544. This entry was posted in News, World War I memoirs and tagged auctions, Dorchester, Dorset, Duke's Auctioneers, First World War Centenary, memorabilia, news, UK News, World War I, WW1. Bookmark the permalink.